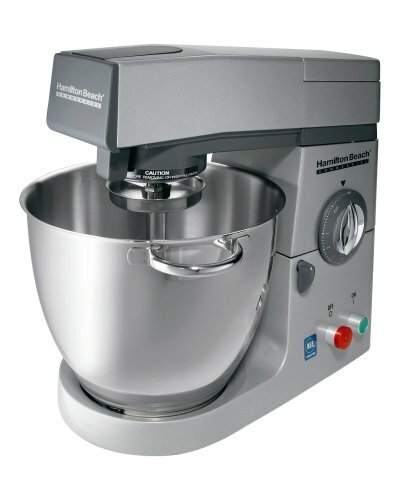 The Hamilton Beach CPM700 stand mixer features: Tough, all-metal gears vary the speed and torque for all three attachments and provide excellent durability. The low center of gravity offers minimal vibration for secure mixing, while the die-cast aluminum body is built to endure years of mixing. Made to perform: The variable-speed, 800-watt motor maintains speed regardless of load, yet is gentle enough to mix delicate foods. No matter what’s being mixed, the mixer provides complete bowl coverage. The flat beater is angled to cover the whole bowl; the whisk is balloon-shaped for maximum aeration; the dough hook is strong enough to knead the heaviest breads. The pop-up head lifts for quick and easy attachment changes and bowl removal. This unique feature eliminates the need to put your hand in the mixture to change attachments or remove the bowl. Also, the tilt-back head makes adding ingredients or scraping the sides of the bowl much easier. Full of safeguards: The recessed -incheson-inches button prevents the mixer from being accidentally activated. A unique safety cut-off stops the mixer immediately anytime the head is raised. In addition, the motor features overload protection to help prevent overheating.